GE is pleased to announce the latest release of the Multilin 850 feeder protection system, designed for high performance protection, control and monitoring of feeders in utilities and industries. A member of the Multilin 8 Series platform of relays, the Multilin 850 provides comprehensive, advanced feeder protection functions for both industrial and distribution utility feeders. Dual feeders (850D) and multi feeder (850P) in electrical applications are also supported. 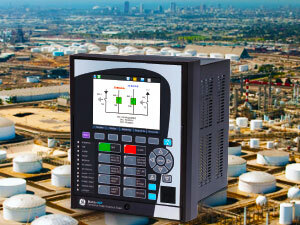 Designed with advanced communications options and detailed asset monitoring capabilities, the new Multilin 850 options provide advanced functionality, including high-performance protection, extensive programmable logic and flexible configuration capabilities. With support for industry leading communications protocols and technologies, the 850D/P provide easy integration into new or existing SCADA or DCS for enhanced situational awareness. The Multilin 850D can be used on distribution feeders, and device redundancy can be achieved using same number of devices. 850P can be applied for the management, protection and control of multi feeder applications in padmount switchgear or ring main units.